The ancient Roman family life was complicated, much like modern day family structures that are built hierarchically. The father was considered to be the head of the household. If there weren’t a father, then it would be the eldest of all the living males in the family that would be given the respect like that of a father. Ancient Rome was a patriarchal society, and as such, the head of every family was the father who had the final say in all matters related to wife, children, maids and slaves. He was the person who looked after the family and business. 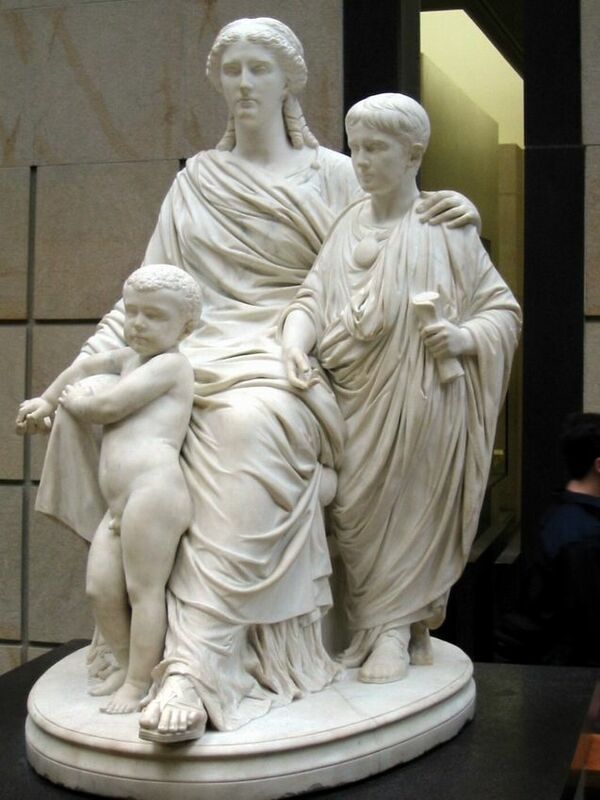 An ancient Roman family was predominantly controlled by the eldest male, either a father or someone in his absence. The oldest living male was called ‘paterfamilias’ or the ‘father of the family’, and he had absolute power in matters related to the family. A father or paterfamilias was the ultimate head who looked after his family members as well as the business and property related matters. The paterfamilias was also authorized to look into religious affairs of the household, like perform religious rites on anyone’s behalf. A man was considered a jewel in ancient Roman society. His worth and social standing depended on how he conducted his family life. The absolute paternal power, also known as ‘patria potestas’ was granted to the father or the eldest male which authorized him to control the lives of all the family members, extending to the slaves and who so ever that resided in his house. 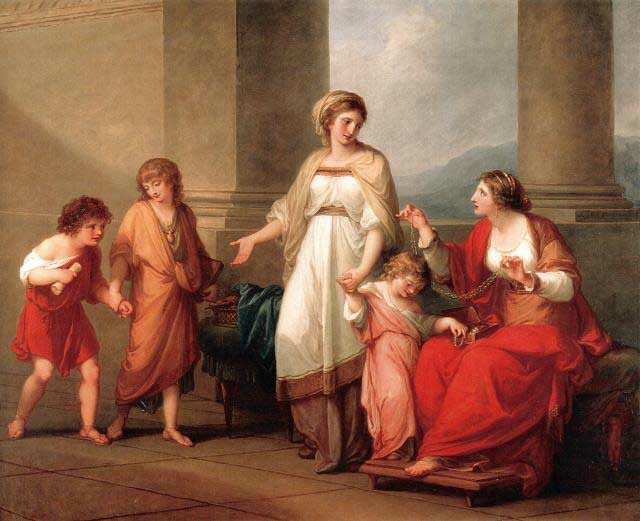 Women had no pivotal role in ancient Roman families, except that they mothered children and looked after the households. In ancient Rome, women had only a few roles whereas the males were given more control and power. The eldest man in the family had absolute power on all members, including his household women-wife, daughters, grand daughters and slave girls. Women were usually married at 12 or 13 years of age to men, in some cases, much older men. Most women were nameless, unlike sons, and could inherit property from their father. However, they had no power, either to vote or to hold any public office. The fathers controlled them and passed their rights on to the husbands when they married. In some cases, a husband even had the right to execute his wife if he found her having an extra marital relation with any other man. But, this is not proven till date. 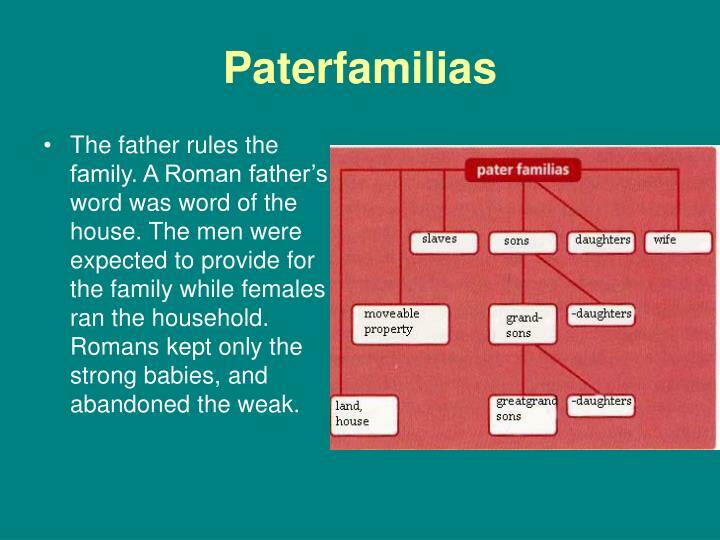 When we speak about ancient Roman family life, we must mention about the concept of the paterfamilias. The term pater means father and familia means a unit of people that descend from the same father. 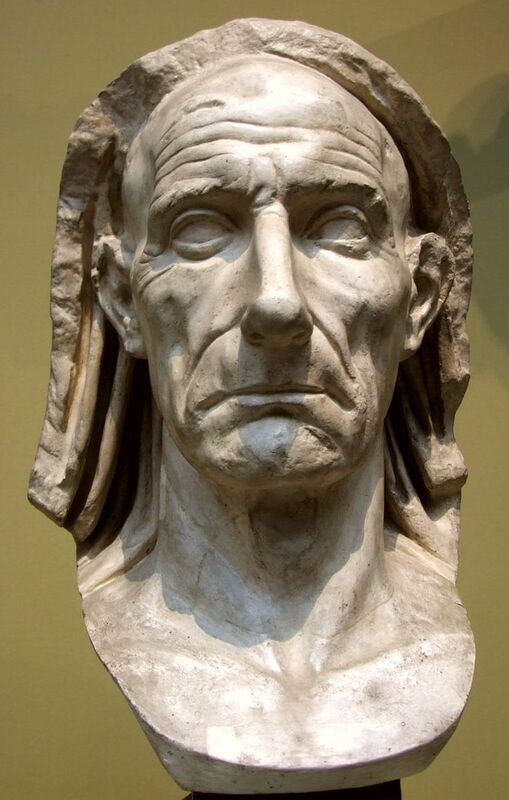 Ancient Rome had families where the heads were the elder males, known as paterfamiliases. The paterfamilias led the family unit that comprised of women, children of the sons and slaves. The paterfamilias didn’t regard the children of his daughter as his own, and they were considered to be the responsibility of their fathers. If a family had the eldest male among its members, he would become the paterfamilias instead of the grown and married men in the family. When the topic of discussion is an ancient Roman household, the role of the paterfamilias cannot be ignored for the eldest male in the family had absolute power and control over every matter, and on everybody that lived under his roof. Such was his authority that on his command, his children could be disowned and thrown out of the house. He could even kill them or sell them in the slave market. As far as ownership of the property was concerned, it was only the paterfamilias who could own it. In the event of his death, the ownership passed on to his sons. In his lifetime, a paterfamilias’s sons could only get allowances or peliculum. This allowance was granted by the orders of the paterfamilias so that the sons could manage and run their own families. The family life in Roman times was thought to be incomplete unless sons were born into them. 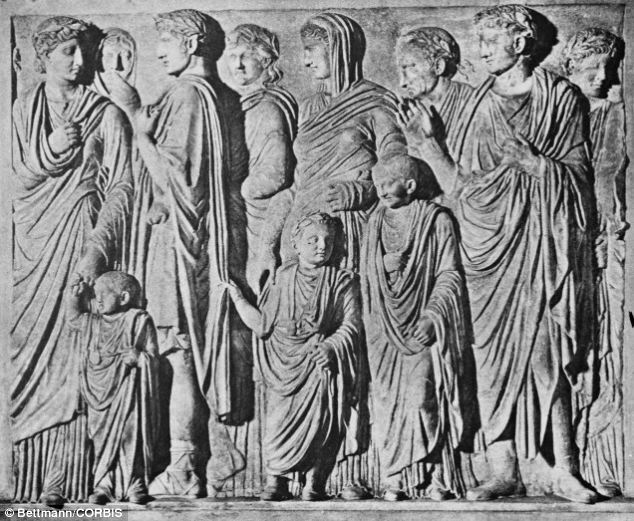 The sons were considered to be highly important for the functioning of ancient Roman families. The reason is sons carried the name of their fathers and continued the family line. In case a family had no sons, the father or paterfamilias would then go on for adoption. This adoption could either take place from outside the house, or from within, such as the adoption of a nephew. It was a common tradition in ancient Rome that when a baby was born, the father would reserve the right to either abandon or kill him. The mother had no rights what so ever. A son was most respected in the family, and when he turned nine years, he was given a name by the father. Roman sons always were given three names: the first being the personal name given to him; the second name being the name of the clan to which he belonged, and the third name being the name of the family. Father’s role in ancient Roman family life was immense. He had the full authority to take all the important decisions of his house and that included the marriage of his daughter or daughters. Most Roman families began only after a pair was married. In marriage, it was a custom to produce males who would go on to serve their country. As far as girls were concerned, they were given in marriage by the decision of their fathers when they attained 12 years of age. It was a common custom for the father to fix the marriage of his daughter without consulting the state or in fact his own family members. Once a girl was married off, she would carry the family name of her husband, and would become the ‘mother of household’. Since her birth, a girl in ancient Rome would only be controlled by her father, and later by her husband. 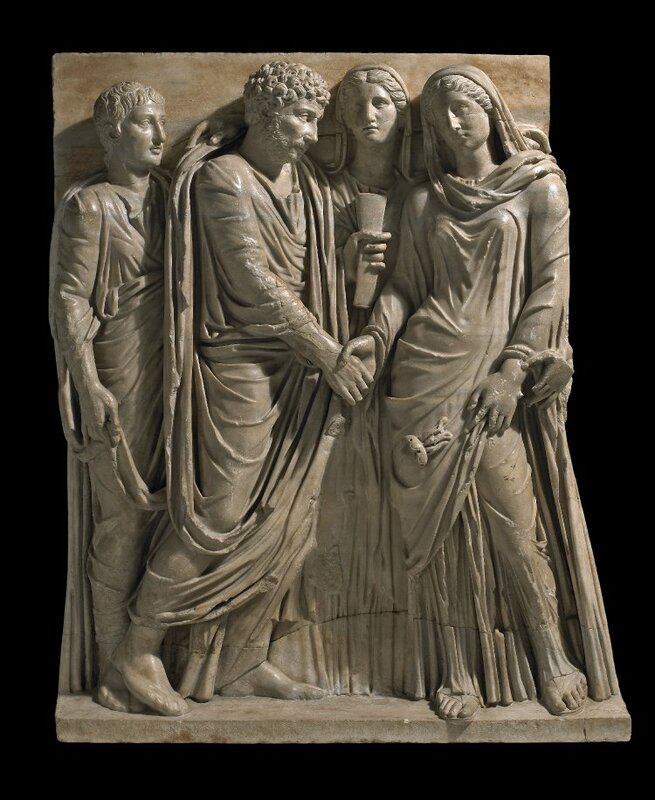 Divorces and remarriages were a common occurrence in ancient Rome. It was quite easy for any Roman couple to obtain a divorce if their marriage wasn’t working. The father had the right to push his offspring to obtain a divorce if he thought it was the right thing to do. He had the power to use such force even if the couple were happy and had no problems. The same was the case with remarriages. Both men and women had the right to remarry. If the wife of a husband died in giving birth, he could get married again. The wife too could remarry if her husband died from any disease, or at war. In case a man married again, his children from his previous marriage would live with him and his new wife in their new house. The mother, if alive, would live someplace else and rarely would have a chance to meet her children. 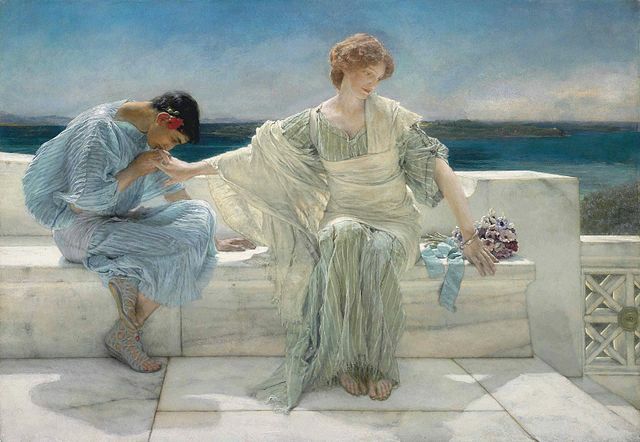 A male dominated society, ancient Rome was very unjust towards its women who were not allowed to have affairs outside their marriages, whereas, for men, it was acceptable. It was common for a husband to enter into illegitimate affairs, but he could only have it with a woman of low strata, like a slave. If a Roman wife came to know of her husband’s infidelity, she couldn’t question or object to it. And, she had to offer her duties as a wife to him. It was not acceptable for men to enter into illegitimate relations with women belonging to the higher strata or married ones. A woman in an ancient Roman family was monitored by her own family members and slaves. In case a husband caught his wife cheating with another man, he had the power to execute the other man. Many Roman men divorced their wives in such cases of adultery. After the mother gave birth to her child, it was up to the paterfamilias to decide whether to keep it or abandon it or even kill it. It was a common ritual that whenever a birthing took place, the baby would be put on the ground by the midwife. The child was said to be publicly accepted only when the paterfamilias picked it up. However, if the paterfamilias decided to abandon the child, he would leave the baby unattended and exposed outside his house. The practice was commonly seen with the birth of such babies that were born sick or were born with abnormalities. Abandonment was also done when a family didn’t have the means to support another member. It was quite common for a family in ancient Rome to be affected with high infant mortality rate. Most babies didn’t survive to see the light of the day, and some 25 percent of children didn’t reach to celebrate their first birthdays. Most Roman children died before reaching their tenth year. High infant mortality was applicable to the babies that were accepted by the paterfamilias. Women who gave births successfully were granted legal rewards by the Roman state which made them financially independent. In such cases, the women could get a divorce from their husbands and lead their own lives. 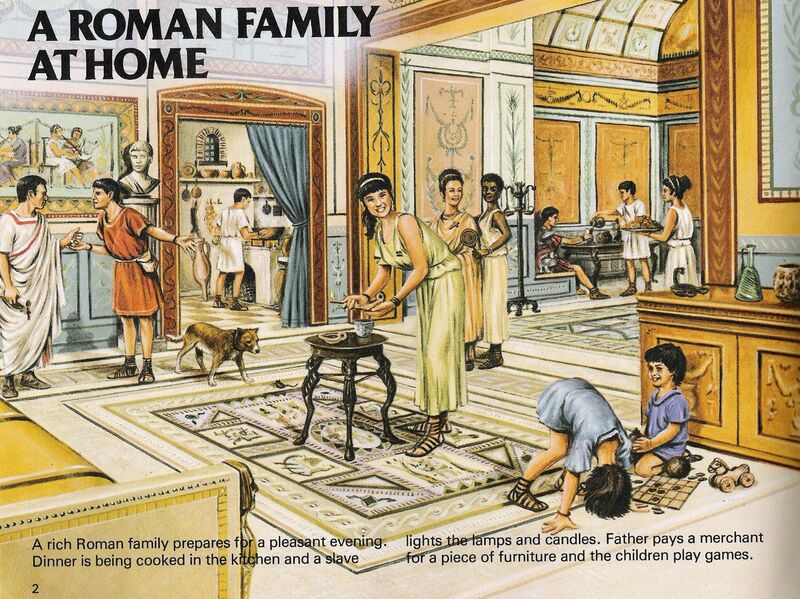 A woman’s role in an ancient Roman family was limited to bearing children and then looking after the household chores. Almost every woman had a difficult marriage that was characterized by the presence of a dominant mother in law and an over bearing husband who could go on his gallivanting ways without being objected. The household’s ruler was the mother in law who usually had an ultimate say. But, when a wife delivered a boy baby, she gained a little authority and rose up the ladder. There were only a few rights given to married women. Husbands could divorce their wives if they failed to produce a male heir. It was only later that women were allowed to give divorce. Her children would stay with their father in case the couple divorced. As far as inheriting property was concerned, women could inherit only a portion of their husband’s property, and not the whole of it. The elderly were taken care by their children who considered it to be their eternal duty or ‘pietras’ to look after their parents. Women died during child birth, and most men perished in the battle grounds. In ancient Rome, the average life expectancy of humans was 27 years. Those who surpassed this age went on to live with their families, the head of the eldest most male being crowned with the title of ‘paterfamilias’. In the 2nd century A.D., a law was made for the aged parents to be looked after by their sons. But, this was not mandatory, and a son could do without following it. The slaves were an integral part of any ancient Roman family, household or Domus. A family couldn’t survive without its slaves who took care of many household chores and helped the women of the house. It was a common custom for Roman families to have slaves, no matter what their social strata was. The only difference was that a higher class Roman family could include some space in its family burial site for the slaves of the house. The slaves often included wet nurses who took care of the children of the family. Once the master died, it was upon the slaves to see that he received a proper and respectful burial. The master had the right to free the slaves and take care of them as his dependents. Ancient Roman family life was a complex unit comprising of the parents, kids, grandparents and slaves. However, there was another segment of people that often found a place in every ancient Roman family – the freed persons. The freed persons were the ex-slaves that worked in the family and took care of the household chores. Once freed by their masters, these people, also called the Liberti continued to live with their masters and work for them. The freed persons were given the names of their masters and carried on their duties. Both freed men and women were allotted space in the burial sites of families they lived with. By reading this article, it can be declared that it was the man who ruled ancient Rome and that included not just the battlefield, the throne, the consul, but also the humble family. It was a man’s world where everyone had to abide by what he said and ordered. The Roman family was a fundamental unit in the society without which ancient Romans could not have survived. Hope this post on ancient Roman family life has been helpful in clearing away a few of your doubts. Do come back with your comments!